Located in the heart of the rainforest of the Daintree National Park, the Daintree Discovery Centre is a multi-award winning, world-class interpretive facility situated 10km north of the Daintree River. Offering visitors the chance to experience this spectacular ancient rainforest from every level, the Daintree Discovery Centre takes you on an amazing journey from the forest floor through the foliage and to the upper most reaches of the rainforest canopy. Open daily from 8.30am to 5.00pm, the Daintree Discovery Centre is just 10kms north of the ferry and an hour from Port Douglas on the corner of Baileys Creek and Tulip Oak Road. The price of admission includes an audio tour in eight different languages. The centre is also home to a 23m high Canopy Tower which offers spectacular views of orchids and giant basket ferns from the top. Keep your eye out for pythons and the double-eyed fig parrots that like to feed in the tops of the trees when the figs are ripe. The Aerial Walkway is another attraction offering unprecedented access to the mid-level of the rainforest where much of the birdlife can be seen including colourful Wompoo Pigeons, Buff Breasted Kingfishers and Cassowaries. You might even be lucky enough to catch a glimpse of a clutch of chicks following the Cassowary along the creek. The Daintree Discovery Centre also features a Display Centre onsite which includes interactive computer kiosks and a DVD theatre with films on creek ecology and the importance of conservation. There are also self-guided audio tours available at the Daintree Discovery Centre, feature a section dedicated to the indigenous people and telling of the lands traditional owners including how the local Aboriginals made use of animals, plants and natural rainforest features. The tours are included in the price of your entry and are available in 8 languages. 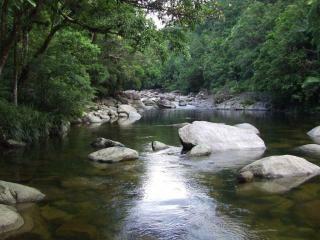 See our range of Daintree Rainforest Tours.